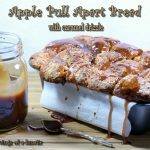 A delicious monkey bread or pull apart bread loaded with apples and drizzled in caramel. Sure to be a hit for dessert or breakfast. There is just something about the smell of fresh bread wafting through your house on a weekend. Add some apples, cinnamon, nutmeg and caramel sauce and it’s almost sensory overload. Notice I say “almost”. To me there is no such thing as “too much of a good thing”. When I make things with cinnamon and nutmeg I just want the food to practically swim in it. I cannot help myself. I find myself dashing on a little more spice, then a little more. Luckily my family shares my obsession with cinnamon and nutmeg. They also share my love of caramel. Nothing screams weekend like that amber sweetness being swirled in a favourite pot on top of the stove. Sometime too much of a good thing is…well, a good thing, When you combine apples, cinnamon, nutmeg and caramel it’s a great thing. Like all great things it’s starts with a simple idea. That’s what Isabel Foodie did with Sunday Supper. She took a simple concept of encouraging families to get together around the table once a week. It’s a concept that dates back for generations in most families. Sitting down at the table used to be a given. It’s what families did at the end of a long day. Nowadays so many of us have gotten so busy that sitting at the table is not something that happens every day. Isabel wants to change that. Once a week we rally together and make dinner and family time a priority. For some of us doing it once or twice a week is all we can manage. For some families it’s an everyday thing. For mine it happens about once a week. With a hubby who works out-of-town, a son who lives across the country and a daughter who is in University and has late classes it is about all we can manage. It’s a nice thing when it happens though. We did it often when my son visited over the holidays. I miss that. So if you have young kids let me just say you should cherish the days when they are young and you can all sit down together. Time flies by and life changes, and one day you’ll wake up and those moments together become fewer and fewer. So hang on to them as long as you can folks. I’d like to take a minute to say a huge thank you to Isabel of Family Foodie for starting this movement. She brought together a wonderful group of people and I am so lucky to count her and the Sunday Supper crew as friends. These folks turn up week after week to bring you amazing food inspiration. They are a dedicated bunch of bloggers with a simple mission. To inspire you all to cook together, sit down to supper as a family and bond with your loved ones over great food. Isabel really believes in what she’s doing and I admire her for her dedication and passion for the cause. So Happy Birthday Sunday Supper, and Happy Birthday Isabel. We are all so proud of you. This week we all picked recipes from past Sunday Supper events that belonged to other members of the crew. 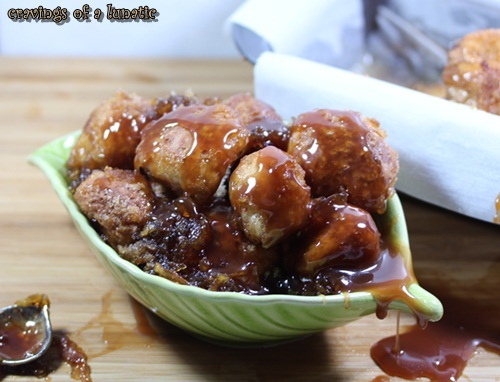 I picked Gotta Get Baked’s Apple Pull Apart Monkey Bread. I remember falling in love with it during our Autumn Apple Party. So when the event was posted and we were asked to pick something from another blogger I just knew this was the recipe for me. There’s so many great recipes to choose from with Sunday Supper so I just went with my gut instinct. It never steers me wrong. Well except that one time in the ’80’s with the big hair. Oh and maybe the Dorothy Hamill haircut in grade school. Perhaps the spiral perm of doom in the ’90’s. Okay so I trust my gut with food, but not hair choices. Whew, glad we cleared that up. 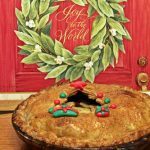 Bloggers like to tinker with recipes but I didn’t change much with this recipe.. I read her notes which said she would not put apples on the bottom again and she was a tad disappointed in the texture of the dough and how moist the monkey bread was. Her family raved about it so she was probably just being too hard on herself as us food bloggers tend to be. But for me if someone makes a note about something I like to heed their advice and make adjustments based on their opinion. So I did two batches of bread. One I dipped in applesauce instead of butter, and one I dipped in vegetable oil instead of butter. I also did not saute the apples. I figured if moisture was the issue leaving the apples uncooked like a pie might work. Then I grated them instead of slicing them so they would cook enough and also the pieces would be small and blend well with the bread. One never knows whether their “theories” will work until the end product comes out of the oven. Then it’s either a swing and miss or a swing and a grand slam. I’m assuming those are the right terms since Lunie hates sports. That’s baseball right? Hm…maybe I should just stick to baking. Whisk the milk, water, butter and honey together in a measuring cup. Set aside. In your stand mixer with dough hook attachment combine 3 1/2 cups of the flour, the yeast and the salt. Turn mixer on low and slowly add the wet ingredients. Once it comes together nicely increase the speed to a medium setting and let it knead the dough until it's smooth and elastic. You can add more flour as needed. I used all the flour. The dough should pull away nicely from the sides of the bowl when it's ready. Turn off mixer and remove the hook. Place dough on a lightly floured surface and knead for a minute or two until it forms a ball. Pop the dough in a well oiled bowl (I use non stick spray) and cover. Let stand in a warm area for about 1 1/2 to 2 hours, it should double in size. While it's doubling I suggest working on the caramel and grating the apples. Once it doubles you want to pop it onto a cutting board. Start dividing it into little balls. Pop those balls in the apple sauce first, then dunk them in the sugar coating. Now place them in a parchment lined tin. I used two bread tins and made two breads instead of one large one. Line the bottom of each pan with some sugar coating. Start layering your bread pieces into the pan. Once you have one layer toss the apple mixture over top. Now add another layer of bread pieces, after dunking them in applesauce and sugar coating like you did the first time. If there's any sugar coating left dump it over top of the bread. Cover the bread and let rise for another 1 to 2 hours, it should double in size. Pop in a pre-heated 350 F oven for about 40 minutes. Mix all the ingredients together in a bowl. Set aside until needed. In a medium saucepan over medium-low heat, combine the water and sugar. Stir until all the sugar dissolves. Now it's a waiting game. Let it cook over medium heat and do not stir. You want to wait until it turns amber. It takes awhile. You can swirl it lightly by sort of swishing the pan around lightly but do not stir it. Once it's amber you remove from the heat. Add the butter and swirl it around till it melts. Add the cream (it's going to bubble up, do not panic it's suppose to do this) and whisk until it's smooth. Add the vanilla and salt. Whisk until smooth. Pour into a jar or container and let cool off for a bit. You want it soft enough to pour over the bread but not hard so it won't pour. Let bread cool a bit. Now pour caramel over top. Serve with a big old caramel apple bread smile! You can substitute other fruit for apples. Or add nuts of any kind. You don't have to pour caramel over top. If you want less moisture leave out apples. Or add some corn starch. Make sure you read over the whole recipe. You have two points where you are letting it rise so you need to account for that. Recipe inspired by Gotta Get Baked. 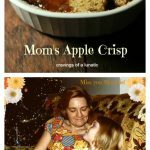 She adapted it from America's Test Kitchen Family Cookbook. Caramel recipe is from Fine Cooking. Thanks to the lovely Gotta Get Baked for inspiring me to whip up this delicious bread. You do good work woman! Love your blog and so happy I got to celebrate our birthday by making one of your dishes. Gotta Get Baked was inspired by America’s Test Kitchen for this dish. I used Fine Cooking’s recipe for caramel. It’s my go to caramel recipe. 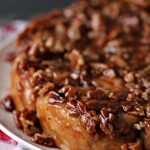 I used their recipe to make my Banana Sticky Buns and have been using it ever since. It’s an amazing caramel recipe and quite simple to make even for beginners. Make sure you stop by all the other Sunday Supper crew’s recipes. They have cooked up some amazing dishes for you this week. Let me just say I’m beyond thrilled to see my Lasagna Soup being made by Susan of The Girl in the Little Red Kitchen, sure hope it turned out fabulous! Also my Chocolate Fudge Brownie Ice Cream was made by the lovely Jennie of Messy Baker Blog. I cannot wait to see how she liked it. Thanks ladies. It was a thrill for me to see those recipes chosen. 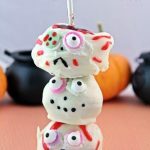 Now I encourage all my readers to get their butts in hear and check out all the lovely blogs who participated this week. Make sure you take a minute to stop by Family Foodie and tell her congrats and Happy Birthday! Thanks so much for joining us this week. We hope to continue to inspire you. Looking forward to celebrating Birthday #2 next year! Kudos to Isabel and her all her hard work. This looks fabulous, Kim! Especially the one with the caramel dripping all down the sides. That’s the one I want and I am not even a big sweet eater. Doesn’t matter. Still want some. Kim, what a wonderful post! Our thoughts on the importance of getting the family together for dinner are very similar. thank you for the lovely compliments – I really hope that your pull apart bread turned out deliciously. It sure as heck looks ah-may-zing and it should always be covered in caramel as creamy and luscious as yours. I don’t want you to judge me which so I’m definitely going to learn how to make vanilla salt and vanilla brown sugar from you 😉 I’m so glad I’ve met you through this fabulous group. Happy Sunday! Thank you for your tips, Kim. Your photos are absolutely tantalizing and I am looking forward to baking these beauties and taking a bite! Oh my goodness!! Apples, cinnamon, nutmeg… How can you go wrong? This bread sounds finger lickin’ good! Truly. I haven’t had breakfast yet and all I want to do is reach into my computer screen and grab your bread! 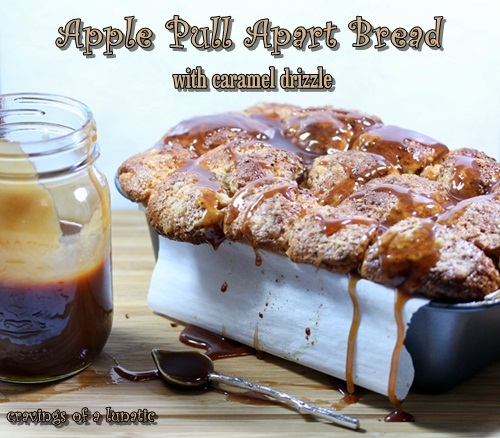 I love apple bread and with caramel, oh man!! Ok, I have to make bread now!! MMMMMMmmmm…..I could add a whole lot more ‘M’s.’ This is just that wonderful! 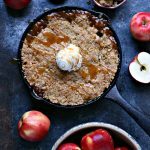 I love apples in baked goods and adding caramel makes this one even more enticing! Drizzling, dunking, pulling, licking, oh so good!! 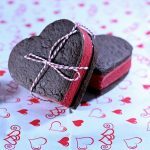 Kim, I am salivating just thinking about this bread – so good!! I could eat this all myself. I have no shame in that fact either. Kim, this sounds wonderful! Apple and cinnamon are like a log fire burning in the hearth – they just scream HOME! Apple, caramel and cinnamon will get me every time. Sitting down as a family for dinner was something we have always done and still do. We did it when I was growing up and so did Adriano and so it came naturally to do it as well. Italians would never eat in shifts or on their laps the way other countries often do now so I don’t think I would have been able to let that one slide. LOL to the big hair. I had a perm only once and wanted to kill myself afterwards. I love the smell of the house when baking with cinnamon and apples. Well, even just plain bread baking is a delight. I’m sure this pull-apart bread would be dangerous to my hips if I had it here. But I’m willing to face the danger and put it on my to-bake list – if only for the scent alone. I really, really would like to grab that last pic and eat it as I write this. Apples, caramel and bread, doesn´t get much better! Great recipe Kim! Kim, this sounds amazing and I’m in love with your photos. I just want to reach through my computer screen and wipe that dripping caramel up with my finger. Oh goodness, this looks incredible! I love that caramel drizzle! Kim this sounds fantastic! I want to gobble up the whole thing right now! It looks so good that I don’t know what else to say.. With that caramel it looks so sinfully tempting! Is it possible to look at this without drooling? Caramel….drizzle….apple….everything about this recipe name is so right. Thanks for sharing, this looks absolutely fantastic and fully droolworthy. I’m fighting a cold a drinking tons of hot beverages. Tea, coffee, you know. I think I need this to go with it! This post is causing me to drool all over, well, everything. 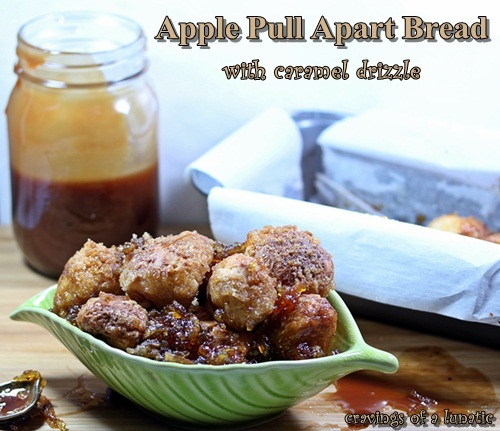 Pull apart bread is so fun but adding apples and caramel to it makes me swoon!